Today I share how I track savings in my Bullet Journal, with a bonus printable to track your own savings! This month I’ve sat down and worked out a savings plan for myself. 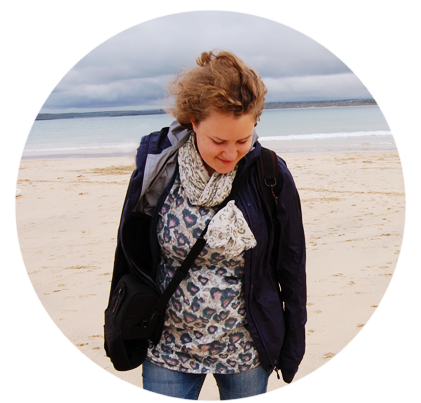 I’ve always been a conscious saver, but the past year and a bit has brought a lot of changes in my life. I’ve changed job twice and before that I worked as a volunteer for a few years, so opportunities to save wasn’t huge. Now that I have a steady income again, it’s time to focus my financial plan. 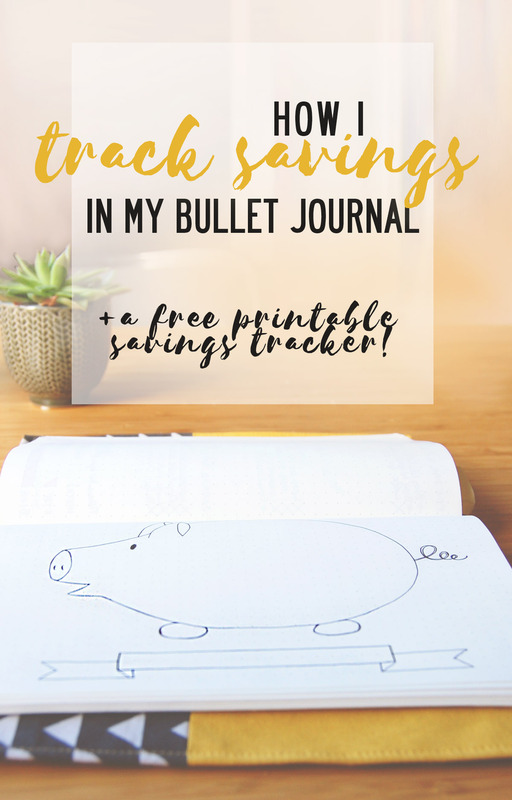 Today I share how I track savings in my Bullet Journal, with a bonus printable to track your own savings! A way to track progress, when you have set a way to measure your goal it’s time to track it. This is really important to me. When I have a fun, visible way to track progress I am more motivated to stick to my goals and see it through. A specific time frame, a goal needs a deadline. If there are no deadline, there is no real pressure to begin. I decided to make my time frame three months, until the end of the year. My goal was decided by looking at my income, regular expenses and how much I could realistically put aside each month. When I had a plan, it was time to find a way to make it more fun! For me the fun part is the tracking. And of course everything is more fun when it’s in my Bullet Journal. So…. Yes, that is a piggy bank, as I said I want fun! I use a Navy Leuchtturm1917* notebook, with a fun cover I made myself. I you like the cover you can buy on in the FindingNorth shop on Etsy. My piggy bank has a place for the goal at the bottom, as I find it helps to have my end goal visible to motivate me. Based on my goal I’m going to color in squares when I save money, until the whole piggy bank is colored in. As a child I used to have a physical piggy bank in my room. I loved that piggy bank and I hope this one will remind me of my old piggy bank and get me motivated to save. I made a printable so you can print and stick it in your own journal. Then write your goal in and start coloring! You can divide the piggy bank into smaller sections to make it easier to keep track. 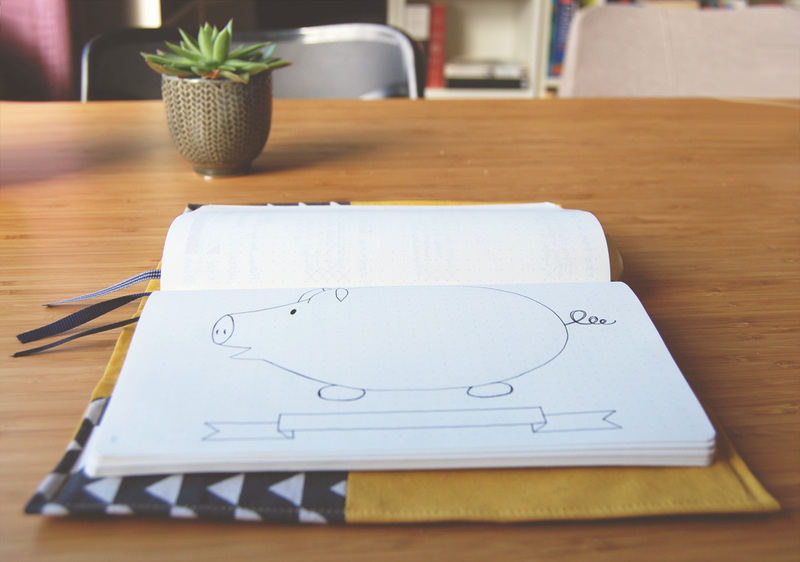 To get the printable simply sign up to my newsletter below and get access to my whole library of free printables, including the piggy bank to track savings and my Bullet Journal reading tracker. This is how I track savings in my Bullet Journal. How do you track savings? How do you stay motivated long term? Please share! Do you want a Bullet Journal Piggy Bank? Sign up today for that and a whole library of resources!